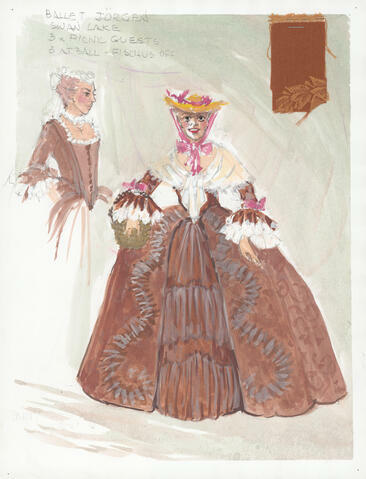 Item is a watercolour sketch of a costume design for Ballet Jorgen's production of Swan Lake. The costume is for three picnic guests. A note on the sketch says that at the ball, the picnic guests' fischus would be taken off. The sketch shows a female figure wearing the costume as well as a detail of the side view with the fischu off. A fabric swatch is stapled to the sketch.